2. It was said of Abba Ammonas that he had killed a basilisk. Going into the desert one day to draw water from the lake and seeing a basilisk, he threw himself face to the ground saying: 'Lord, either I die or he does,' and immediately, by the power of God, the basilisk burst asunder. 5. Some brethren found life difficult where they were living. Wanting to leave, they came to find Abba Ammonas. He was out on the river. Seeing them walking along the bank of the river, he asked the sailors to put him ashore. Then he called the brethren, saying to them, 'I am Ammonas, to whose dwelling you are wanting to go.' Having comforted their hearts, he sent them back whence they had come, for this difficulty did not arise from sickness of soul, but simply from natural annoyance. 6. One day when Abba Ammonas went to cross the river, he found the ferry-boat ready to go and sat down in it. Then another boat came to the place and transported the men who were there. They said to him, 'Come here, Father, and cross the river with us.' But he replied, 'I will not embark except in the public vessel.' As he had a handful of palm branches, he sat down, weaving them, and then undoing them, until the boat came alongside. Thus he made the crossing. Then the brethren made him a reverence, saying 'Why did you do that?' the old man said to them, 'So as to walk without any anxiety of spirit.' That is an example; we must walk in the way of God in peace. 7. 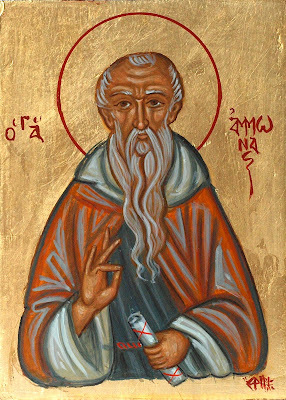 Abba Ammonas was going to pay a visit to Abba Anthony, one day, and he lost his way. So sitting down, he fell asleep for a little while. On waking, he prayed thus to God, 'I beseech you, O Lord my God, do not let your creature perish.' Then there appeared to him as it were a man's hand in the heavens, which showed him the way, till he reached Abba Anthony's cave. done; give her a penance.' But he, having marked the young girl's womb with the sign of the cross, commanded that six pairs of fine linen sheets should be given her, saying, 'It is for fear that, when she comes to give birth, she may die, she or the child, and have nothing for the burial.' But her accusers resumed, 'Why did you do that? Give her a punishment.' But he said to them, 'Look, brothers, she is near to death; what am I to do?' Then he sent her away and no old man dared accuse anyone any more. finding the woman, Abba Ammonas said, 'What is this? May God forgive you!' After praying, he made everyone go out, then taking the brother by the hand he said, 'Brother, be on your guard.' With these words, he withdrew. It should be noted that some believe the Abba Ammonas commemorated on January 26th is not the Bishop above, but the Priest, of whom Bishop Palladius writes in his Lausiac History, chapter 72. 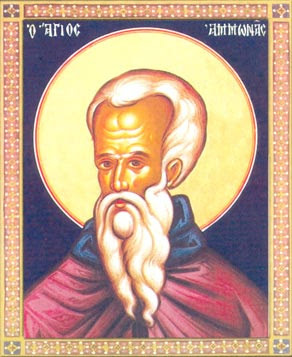 However, Saint Nikodemos the Hagiorite is more inclined to believe it is the Bishop who is commemorated on this day. Nonetheless, below is the account of Abba Ammonas the Priest. There is another place of solitude in Egypt, in very difficult country near the sea not far from the city of Diolcos, where many great anchorites lived. We met there a holy and very humble priest called Ammonas who had visionary gifts. Once when offering the Holy Sacrifice he saw an angel standing at the right hand of the altar taking note of the brothers who came seeking God's grace and writing their names in his book. If anyone was missing from the synaxis he saw their names being crossed out, and within three days they were dead. Demons often tortured him so badly that he was unable to stand at the altar to make the offering, but an angel came and took him by the hand and immediately gave him strength so that he was able to stand firmly at the altar. The brothers were amazed at the sight of his torments.